The objective is to discern how Charles Darwin's Origin of species (1859) and the theory of natural selection and evolutionary biology - 'a grain in the balance will determine which individual shall live and which shall die'- are core to achieving environmentally and climate-smart, economically viable, sustainable animal agriculture in a changing climate. Darwin's 'survival of the fittest' theory implies inherent comparative advantage of survivors over the succumbed in any given environment. An animal's phenotype (P) results from interaction of its genotype (G) and the environment (E), expressed as P = G x E. Human migration has transferred livestock breeds from places of origin to distant continents and agro-ecological zones, far from where they have inherent comparative production advantage. For example, crossbreeds of Bos taurus and Bos indicus have higher average performance than median of either parent population. However, the heterotic effect of hybrids is associated with loss of environmental adaptation compared with parent populations. Indigenous breeds, their phenotypes and ecotypes thrive best in distinct environments, ceteris paribus. An environment is the sum total of conditions that influence animal productivity in the habitat. These include nutrition, genetics, disease, exposure to parasites, management practices, climate, rainfall, humidity, heat and cold stressors, and advisory services. Hybrids lose some adaptive capacity compared with parents, and require habitat modifications if they are to express their fullest genetic potential. In the light of this and of global warming challenges to livestock production, it is scientifically and technically prudent to exploit the inherent comparative production advantages of indigenous genotypes, phenotype and ecotypes, when mitigating climate change, more so in low-input animal agriculture systems of sub-Saharan Africa and at similar locations. Climate change poses multidisciplinary challenges that require integrated collaborative cross-discipline research, extension and training to provide holistic solutions. The ability to convert grass, shrubs and foliage into nutritious food and animal fibres is why ruminants occupy 45% of the world's ice-free land area (Steinfeld et al., 2006). Livestock production contributes 60% to 70% of the global agricultural economy, and has an asset value of $1.4 trillion (Thornton et al., 2011; FASS, 2012). The livestock sector value chains employ around 1.3 billion people and supports 600 million farmers in developing countries (Thornton, 2010). Animal agriculture affects and is affected by the environment. This sector is invaluable for public health, social equity and economic growth (World Bank, 2009). Protein of animal origin is 34% of human diets (Gill & Smith, 2008; FAO, 2010) and animal products provide 17% of our energy consumption (Rosegrant et al., 2009). Livestock contribute to anthropogenic greenhouse gases (GHGs) emissions into the atmosphere, and is implicated in global warming and climate change. The main GHGs of animal agriculture origins include carbon dioxide (CO2), methane (CH4) and nitrous oxide (N2O). Hristov et al. (2013) estimated that 7% to 18% of anthropogenic GHGs come from livestock farming, specifically from enteric fermentation, manure, production, transport of feed and changes in land use. Gerber et al. (2013) reported that 29% of agricultural N2O emissions are related to manure and fertilizer application to pastures. The global cattle population is 1.3 billion, of which 50% are in developing countries, produce 58 million tons of CH4 per year (US EPA, 1994). Beef cattle account for 71% of the GHGs, dairy 24% and 5% is shared among goats, sheep, swine and horses (US EPA, 1990-2000). The global livestock GHGs emissions are estimated to be 7.1 Giga tonnes carbon dioxide equivalents (GT CO2 eq. yr-1), which is 14.5% of all anthropogenic GHGs (Gerber et al., 2013). GHGs statistics are worrisome and threaten the sustainability of the livestock sector, spurring intense debate on livestock-environment interaction (Otten & Van den Weghe, 2011). This paper reviews the effects of climate change on livestock production and discusses mitigation options, including the ways in which natural selection as in Darwin (1859) and Von Humboldt (1849) could be useful in adapting livestock farming to climate change in Africa and beyond, and in assessing the best possible extension, research and training approaches to complex challenges posed by global warming to the sector. Global warming has two components, namely natural global warming and anthropogenic warming (Figure 1) The natural global warming is caused by i) Earth's orbital changes as explained in Milankovitch Theory, ii) volcanic emissions of GHGs and aerosols, iii) movement of the tectonic plates, and iv) El Niño-Southern Oscillation (NASA, 2016). 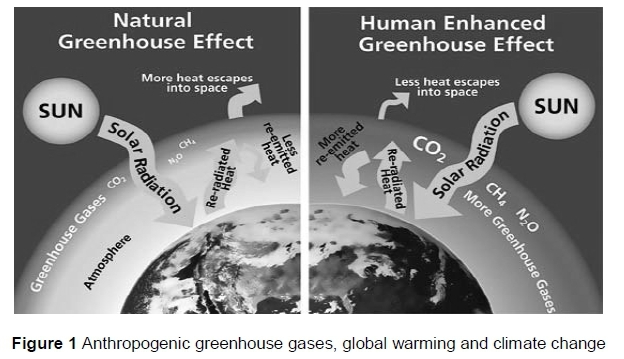 Anthropogenic global warming results from human activities that increase GHGs in the atmosphere (Figure 1). Greenhouse gases retain atmospheric infrared radiation causing the 'greenhouse effect' and have different global warming potential (GWP). GWP is the amount of energy a GHG adds to atmospheric warming, relative to the warming effect of the same amount of CO2 (IPCC, 2013). Therefore, although the amount of CH4 in the atmosphere may be lower than that of other GHGs, its higher GWP makes it an effective emission in global warming. The IPCC (2013) reported that CH4 is 20 times more effective than CO2 in trapping atmospheric heat, and concluded that atmospheric concentration of CH4 has increased by 143% in the past two centuries, owing mainly to human activities including agriculture, forestry, deforestation, transport, energy generation, industry and buildings. 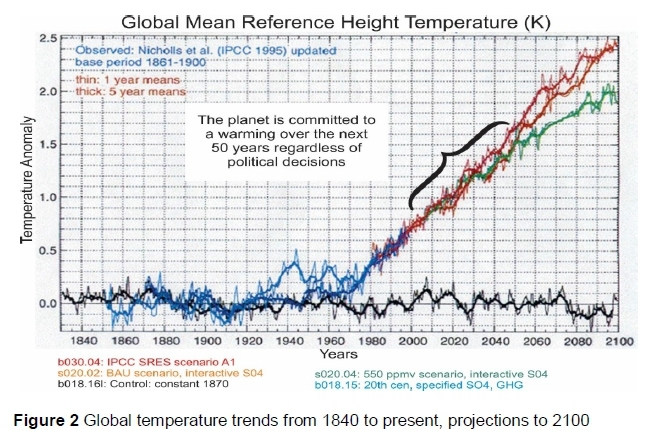 The IPCC (2013), Shields and Orme-Evans (2015) and NASA (2016) link increasing GHGs to human activities and to the global warming trend (Figure 2), starting from the industrial revolution in 1750 to date. The National Aeronautics and Space Administration (NASA, 2018) reported that the 16 warmest years since 1880 have been in the last twenty years, and 2016 and 2017 were the warmest years in recorded history (Figure 2). 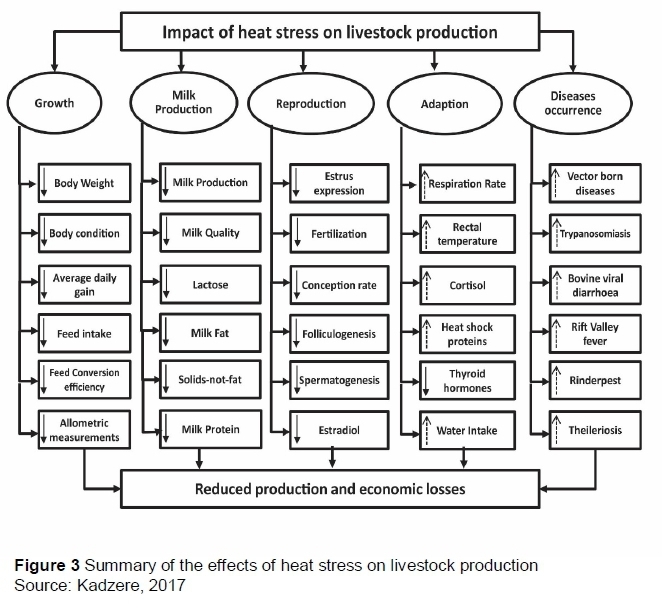 Climate change poses challenges to animal agriculture by providing conditions for heat stress (Figure 3). Heat stress causes behavioural, chemical, physical, nutritional, physiological and metabolic responses in livestock that are geared toward preserving cell integrity and survival. Literature abounds on the effects of heat stress on livestock production, which includes these authors (Dowling, 1955; Huhnke & Monty, 1976; Escobosa et al., 1984; Parsell & Lindquist, 1993; Hansen, 2004; Sevi et al., 2001; Kadzere et al., 2002, Perez-Crespo et al., 2008), who are summarized in Figure 3. The increasing global average temperatures may result in vegetation shifts, for example C3 photosynthesis plants being displaced by the less nutritious C4 photosynthesis plants and in their turn C4 vegetation being displaced by desert-adapted woody crassulacean acid metabolism (CAM) photosynthetic plants, whose stomata remain shut during the day to reduce evapotranspiration water loss, but open at night to collect CO2. Such changes in veldt species composition erode the feed base and affect animal agriculture. The displacement of C3 by C4 photosynthesis forages increases enteric GHGs emissions, because C4 forages have a higher methane conversion rate (MCR) compared with C3 forages (Van Soest, 1994). This higher MCR is attributed to elevated fibre and lignin content of C4 plants and to their low levels of non-fibre carbohydrate (Van Soest, 1994), which makes them less digestible (Minson, 1990). Sustainable agriculture is farming that meets current and future societal needs for food and fibre, preserves ecosystems' integrity, is healthy for lives and does so by maximizing the net benefit to society when all costs and benefits are considered, as sketched in Figure 4 (Kadzere, 2017) in sub-Saharan African environments. Indigenous breeds thrive with minimum inputs compared with imported ones. These breeds are pivotal to the development of climate-smart animal agriculture, especially in communal and small-scale farming systems characterized by low investment (Meissner et al., 2013a; 2013b). Animals bred in temperate environments cannot express their fullest genetic potential in African environments owing to heat stress (Figure 3). Global warming exacerbates this. In addition to warm weather, they must contend with factors influencing production in the local environment, including disease, exposure to parasites and seasonal fluctuation of the veldt nutrition base (Figure 5). The quality of natural pasture is closely linked to quantity and distribution of rainfall. Indigenous livestock are adapted to seasonal variation (Meissner et al., 2013b), and may become browsers in periods of poor grass quality. I hypothesize that animal agriculture would be environmentally and climate-smart if adaptability of indigenous breeds was exploited to the fullest in any given production environment, and especially so in low input, resource-poor livestock systems of sub-Saharan Africa. In input-intensive systems with supplementary feeding, sound animal health and management, the approach would be different. Each of the 150 or so Bos taurus and Bos indicus African cattle breeds has adapted to its environment through centuries of natural selection (Mwai et al., 2015). Temperate breeds selected for meat and milk must acclimatize, if they are to produce in tropical and subtropical African environments (Buffum, 1909). There are many stressors in sub-Saharan African environments that have led to the evolution of a rich genetic diversity of its livestock breeds (Burrow, 2012). Burrow (2012) determined the relationship between economic productive and adaptive traits in tropical and subtropical breeding programmes, and found that it was possible to improve genetic and adaptive traits simultaneously without compromising either. Burrow (2014) suggested a re-ranking of breeds across environments through use of breed type(s), phenotypes and ecotypes best suited to each habitat. Zebu or humped cattle (Bos indicus) are the main type in sub-Saharan Africa (Hanotte et al., 2000). African indigenous taurine (Bos taurus) humpless cattle are exclusive to West Africa. These Bos taurus and Bos indicus breeds, including their crosses, the sanga (indigenous taurine and zebu) and zenga (zebu and sanga) are physically adapted to local environments, where European breeds are not (Rege, 1999). Sanga cattle have cervico-thoracic humps and are adapted to seasonally harsh environments of eastern and southern Africa (Okello & Sabiiti, 2006). The rich genetic diversity of cattle in sub-Saharan Africa can be used to contribute to technology development for climate-smart livestock production if their productive efficiency is increased and hardiness retained. Bos taurus, zebu cattle and Bos indicus acquired genes that confer thermo-tolerance at physiological and cellular levels after the B. indicus diverged from B. taurus between 110,000 and 850,000 years ago (Bradley et al., 1996; MacHugh et al., 1997; Hansen, 2004). Zebu breeds regulate their body temperature better when in thermal stress than European B. taurus breeds (Kadzere et al., 2002; Hansen, 2004), and have better overall production in tropical environments (Burrow, 2012). Further, zebu and zenga breeds, including the Karamajong zebu in Uganda, tolerate harsh environmental conditions such as very dry climates, in which they can drink only once in two days (Thomas, 1994). Similarly, Turkana cattle in Kenya can survive on poor pasture and scarce water, and can walk long distances (Rege et. al., 1999). Angoni cattle in Zambia and Ugogo Grey cattle in Tanzania are adapted to browsing during long droughts (Felius, 1995), whereas Landim cattle in Mozambique thrive in hot humid weather, and are tolerant to foot and mouth disease (Felius, 1995) (see Table 1). The Jem-Jem cattle in Ethiopia are adapted to cold and wet conditions (Rege & Tawah, 1999), as Dexter are in the Scottish Highlands. 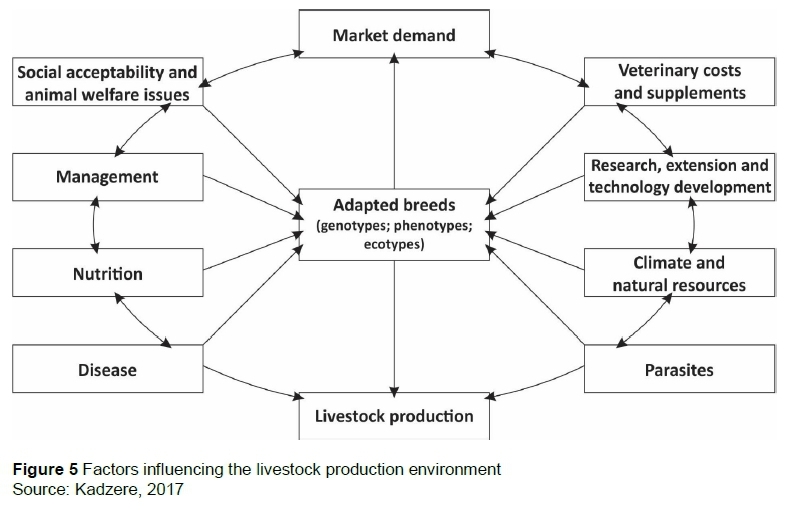 These are examples of physiological adaptations of indigenous livestock breeds to their environments which are invaluable to developing climate-smart livestock production strategies and technologies to mitigate climate change. The B. taurus of sub-Saharan Africa are humpless shorthorns and longhorns that are smaller than zebu (Rege, 1999) and are uniquely adapted to harsh climate (Hansen, 2004), including being resistant to various endemic diseases (Murray et. al., 1984; Mattioli et al., 2000). For example, the N'Dama breed is tolerant to trypanosomiasis (Roberts & Gray, 1973), whereas zebu are susceptible (Murray et al., 1982), although Njogu et al. (1985) reported some tolerance levels in East African Orma Boran breed. Trypanosomiasis is caused by T. Congolese, T. vivax and T. brucei spp., and occurs between 14° north and 20° south latitude (Steverding, 2008) and has suppressed economic and cultural development in Central Africa (Simarro et al., 2011). N'Dama (taurine) cattle show superior heat tolerance compared with zebu (indicine) and metabolize water more efficiently. This characteristic makes them better suited to hot and water-stressed regions (WISP, 2010). The use of modern technologies, including genome-wide selection and gene-splicing, provides tools that can go a long way towards developing high-producing climate change-adapted phenotypes from indigenous breeds. Ticks and tick-borne diseases curb cattle production in Africa and throughout the world. 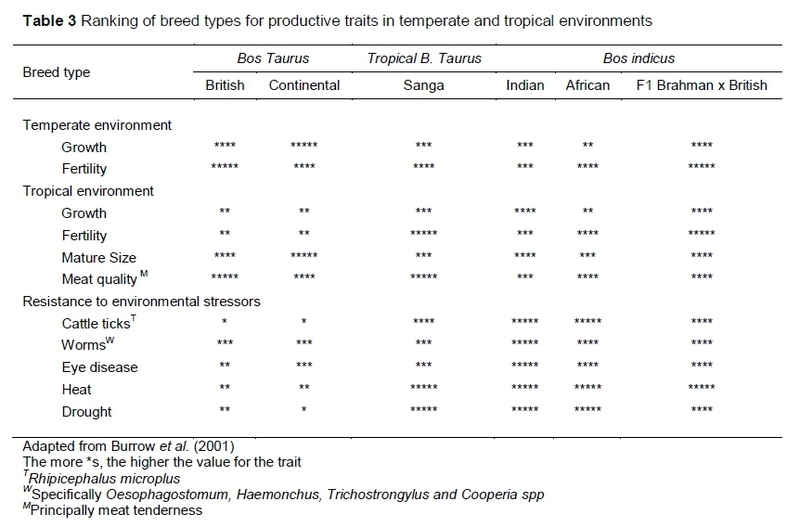 Some Bos indicus breeds and their phenotypes show heritability of resistance to ticks (Table 2) compared with European taurine animals (Piper et al., 2009). N'Dama and Ankole cattle are tick resistant in their habitats (Mattioli et al. 2000). Rege & Tawah (1999) also found that Tswana cattle (sangaj had high tolerance to heavy tick infestations and were resistant to endemic heartwater, as did Asselbergs et al. (1993) in Landim cattle in Mozambique. The literature abounds in studies on disease, heat and parasite adaptations of cattle in Africa. This suggests that indigenous breeds can be exploited to mitigate climate change by breeding tick resistant or tolerant genotypes, as hypothesized. 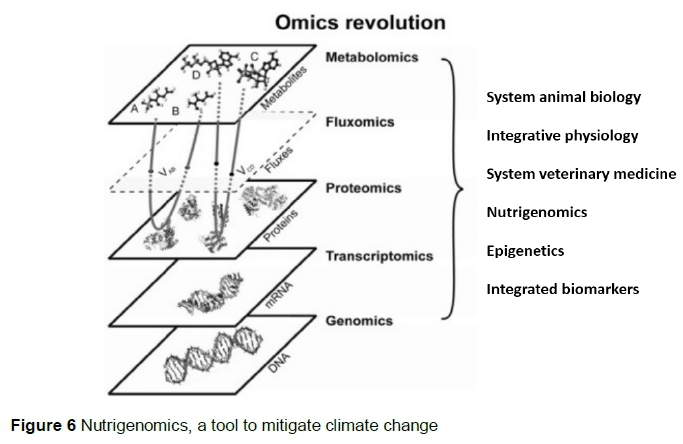 Research and technical progress will facilitate the development of strategies to mitigate climate change as better and deeper insights into the livestock genome, metabolome, proteome and microbiome compartments are gained (Thiruvenkadan, 2016). Such insights and advances in bioinformatics open new frontiers and possibilities to conducting holistic research that strengthens our understanding of the interplay among factors that influence animal production, including its genotype, nutrition, health, physiology, the environment, management, climate change, policy and politics. Those insights will enable the conception and development of mitigation strategies against climate change. Some of the technologies can be based on i) suppressing methanogens and reducing enteric methane (CH4) production and improving efficiency, ii) feeding precision diets that reduce excreta and GHG emissions, iii) selecting appropriate genotypes and (iv) improving management. Major dairy breeds originated from temperate climates and high-producing cows are susceptible to heat stress in hot environments (Faquay, 1981; Kadzere et al., 2002; Srikandakumar & Johnson, 2004) such as sub-Saharan Africa. High producing cows cannot achieve their genetic potential under heat stress, unless the environment is altered to control temperature. Selecting heat stress resistant phenotypes and ecotypes within these breeds is slow owing to long generation intervals (Ravagnolo & Misztal, 2000). However, Erbe et al. (2012) and Nguyen et al. (2016) used genomic selection for heat tolerance in dairy cattle to speed up genetic progress, and improved accuracy of genomic predictions. Similarly, Garner et al. (2016) used genomic technologies and genome-wide deoxyribonucleic acid (DNA) markers to identify mutations that influence variation in multi-gene traits such as heat tolerance. In an earlier work, Franks & Hoffmann (2012) showed that a number of genes were associated with climate change adaptation, and concluded that genetic regulatory networks and epigenetic effects could be relevant to evolution. Recently the technology to gene-edit large animal genomes has opened new possibilities to mitigating climate change. Indigenous cattle breeds underperform when compared with commercial breeds on narrow production traits such as beef and milk yield alone (Table 3). The picture changes once holistic comparisons are made that include multiple traits (Table 3) that influence production (Figure 5) in tropical and subtropical environments. Therefore, comparing indigenous breeds with commercial improved' breeds on a single characteristic is myopic, because it excludes other parameters that are important to economic livestock production. There is need to conduct trade-off analyses because the perceived production advantages associated with heterosis in B. indicus x B. Taurus offspring come at a cost of loss to environmental adaptability, which is important in the light of climate change. This suggests the need to develop regional breeding and selection programmes that involve adapted genotypes, phenotypes and ecotypes in specific environments. 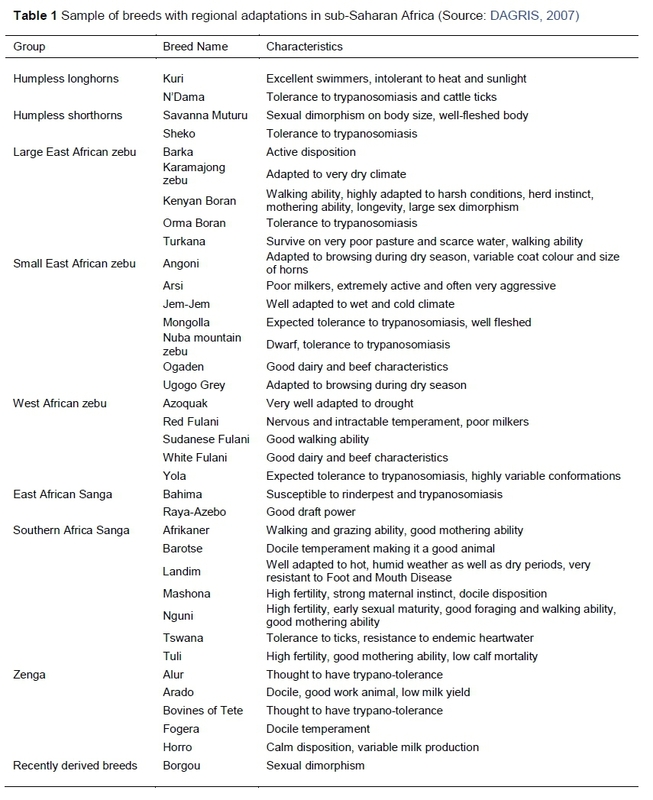 These may include Nguni and Tswana cattle in southern Africa, Boran and Umoja in East Africa and Fulani and N'Dama in West Africa (Table 1). These indigenous breeds have proved to be productive in their own environments and selecting and breeding from their high producing phenotypes and ecotypes would go a long way towards concentrating desired genes for production and tolerance to heat stress, and thus to mitigate climate change. Continuous advances in livestock performance physiology provide opportunities to increase beef production and lower the carbon footprint per unit product by for example treating feedlot cattle with β-adrenergic agonists (ßAAs) (Stackhouse et al., 2012). Furthermore, in dairy, Capper et al. (2008) increased milk production and simultaneously reduced GHGs through application of recombinant bovine somatotropin (rbST). However, the use of these technologies is challenged by segments of society and animal welfare groups (Dohoo et al., 2003; SCAHAW, 1999). This makes it important for science, and not emotions and perceptions, to validate efficacy and food safety for such treatments. About 65%-75% of variable costs in any livestock enterprise are ascribed to feed. Feed production accounts for 47% of the GHGs from livestock farming (Gerber et al., 2013). This makes animal nutrition a strategic target area to mitigate climate change because improving feed/forage quality improves digestion and reduces enteric CH4 production. Knapp et al. (2014) grouped enteric CH4 mitigation interventions in three categories: i) feeding and nutrient management, ii) rumen modifiers and iii) genetic and management. Improving production efficiency through technical progress in nutrition and genetics leads to less feed and water consumed per unit of product, and this is climate smart. Kadzere et al. (2002) used USDA dairy production data from 1940 to 1995 and calculated that the average milk production per cow per 300-day lactation increased by 338% from 2096 in 1940 to 7462 kg/year in 1995. The increase was attributed to improved production efficiency by improved genetics, nutrition and management. Similarly, USDA (2007) calculated that the number of milk cows globally dropped from 133 to 125 million between 1997 and 2007, yet world milk production increased from 377 to 418 million metric tons, which translates to an 18% increase in production efficiency in that 10-year period. Earlier on, Kriss (1930) reported strong associations between CH4 production and dry matter intake in cattle fed temperate forages, and showed that CH4 production was higher in cattle fed tropical forage diets, especially those on higher intake, than from the ones on temperate forages. That finding was validated by Van Soest (1994) and Reid (1994), who reported independently that the voluntary intake of forage is a factor of its digestibility and nutrient utilization. These authors attributed the higher CH4 production in cattle on tropical forages, as reported by Kriss (1930) to the poor digestibility of those forages compared with temperate ones, leading Van Soest (1994) and later O'Mara et al. (2008) to postulate that when the forage quality is improved, it lowers the life-time GHGs emissions per unit of animal product, owing to increased digestibility of feed and animal productivity. Progress in nutritional technologies allows in-depth study of the gastro-intestinal microbiome and opens golden opportunities to manipulate methanogens and reduce enteric CH4 production. Reducing CH4 production would mean that more feed energy would be partitioned into the intermediary metabolism for more productive purposes, which improves feed efficiency. Enteric methanogenesis undermines efficient use of feed and should be minimized without disrupting proper rumen function, to mitigate global warming. To this effect, several technologies have been developed and are mentioned briefly. They include i) adding feed additives such as yeast (Chung et al., 2011), fibrolytic enzymes (Chung et al., 2012), ionophores (monensin) and rumen modifiers to enhance dry matter intake and suppress acetate production, which reduces the amount of hydrogen released (Odongo et al., 2006) and of plant bioactive compounds such as saponin (Holtzhausen et al., 2009) and inhibitors such as 3-nitrooxypropanol (Haisan et al., 2014); ii) adding dietary fat to lower enteric CH4 (Johnson et al., 2001) by reducing the amount of organic matter fermented in the rumen, curtailing rumen methanogen activity and through bio-hydrogenation of unsaturated fatty acids (Eugene et al., 2008); iii) feeding more concentrate than forages to reduce CH4 emissions (McAllister et al., 1996; Lovett et al., 2005J; iv) increasing the corn silage content of diets, especially in dairy cow nutrition to lower CH4 production (Benchaar et al., 2001); v) ensiling forages at earlier regrowth stage, which leads to improved digestive efficiency and to reduced GHG emissions; and vi) grinding and pelleting forages before feeding, which lowers GHGs. The emerging field of nutrigenomics (Figure 6) studies the ways in which bioactive chemicals in food and feed affect the animal's metabolism by altering gene expression. It brings together several disciplines, including bioinformatics, biology, epidemiology, epigenetics, genomics, functional genomics, molecular biology and nutrition (Benitez et al., 2017) and will provide technologies to feed according to the animal's genetic predisposition for production. That will lower GHGs emissions and excreta, thus nutrigenomics opens new opportunities to mitigate climate change nutritionally. Nutrigenomics provides opportunities to control gene expression through dietary means at any point on the pathway from packing and unpacking DNA to protein processing and degradation. 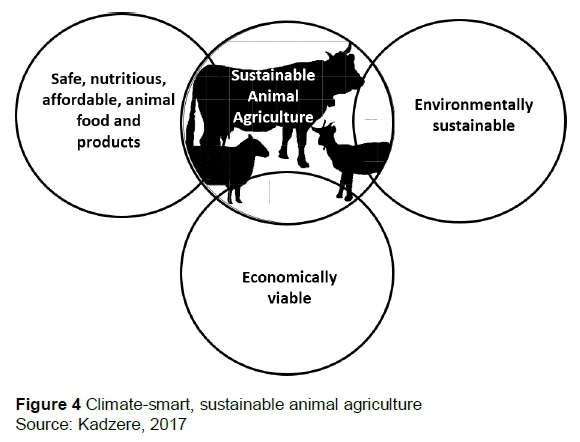 Such possibilities provide opportunities to optimize diets and nutrient provision to livestock (Zdunczyk & Pareek, 2009), which is climate-smart animal nutrition. Although water is not strictly a nutrient, it is essential in livestock production, and 90% of the 'water footprint' from animal products that originate from intensive systems is related to feed production (Mekonnem & Hoekstra, 2014). Livestock on natural pasture, as in communal small-scale and extensive commercial production systems in sub-Saharan Africa, do not use extra water to produce pastures, which lowers the water footprint of their products and supports earlier findings by Scholtz et al. (2013). 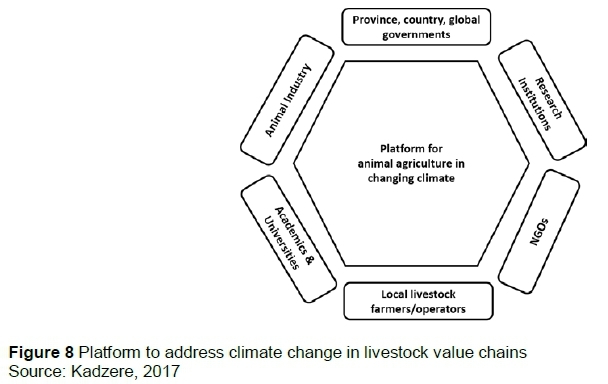 Climate change poses complex challenges to animal agriculture that require integrated collaborative solutions from extension, research and training services (Figure 7). The phenomenon of climate change is new and requires people who serve in extension, research and training to continuously learn and upgrade their skills to keep pace with ever-changing sector norms and the expanding knowledge base. 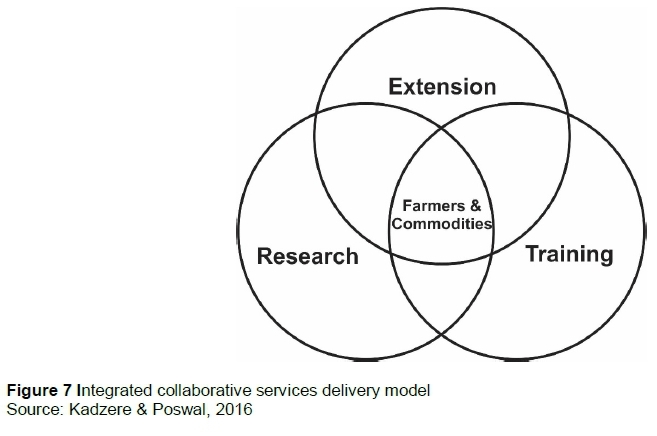 To be successful, collaboration in services delivery must be holistic, and involve all stakeholders, including the public, private and non-government sectors, government departments, producers, industry value chains and tertiary education institutions at local, national and international level (Figure 8). Climate change and livestock production and agriculture have local, national, regional and international dimensions that must be addressed concurrently because GHGs emitted in one country can influence production in another, and overproduction of a commodity in one locality affects prices elsewhere in the global marketplace. Modern electronic communication technologies, including webinars and subject matter blogs, can bring stakeholders together in real time across disciplines, regions, countries and around the globe to collaborate, seek and find solutions to global warming and climate change. Environmental and climate-smart livestock production is guided by the animal's genotype and its environment. This allows optimum exploitation of the animal's inherent comparative production advantage in its environment, is 'in sync' with Darwin's theory that 'a grain in the balance will determine which individual shall live and which shall die', and reduces production costs. The interrelationships between the animal and its environment are at the core of successful livestock production. Animal production efficiency must be improved without compromising product quality, food safety, animal welfare and disease tolerance. Collaborating within and across disciplines at local, national, regional and international levels and providing multi-faceted solutions to climate change in livestock production (Figure 8). The author is grateful to colleagues at Döhne Agricultural Development Institute for an environment that is conducive to excellence in agricultural research and technology development, and to Karen Puchert for assisting with diagrammatic illustrations in this paper.